In 2012, bass clarinetist Barbara Haney (recently retired bass clarinetist from "The President's Own" US Marine Band) asked if I would accept a commission to write her a solo piece to premiere at the 2013 ICA ClarinetFest, to be held in Assisi, Italy. This was a fast "yes"! Barbara and I both played in the Haddonfield Symphony and had back-to-back bass clarinet lessons with the Philadelphia Orchestra's Ron Reuben in the early 1980s, and while I was a composer keeping up with performance, it was clear that Barbara was a stellar bass clarinetist with a big career ahead. Occasional bass clarinet duets together was an inspiration that still helps my playing 30 years later. Flowers are introduced through an innocent yet florid song, followed by a chant-like passage from the "voice" of St. Francis. The movement then continues as a duet between St. Francis and the flowers. The flowers represent all the fruits of creation as well as simply being flowers in the garden. St. Francis's chant begins the movement as a flowing cantilena, interrupted by a dramatic eruption of bird calls (taking advantage of the bass clarinet's tremendous range and agility). The movement then continues as a dialog between St. Francis and the birds. A ferocious interruption representing an angry wolf who terrorizes the village is perfect for an eager bass clarinetist. St. Francis is heard befriending the wolf, and their duet progresses from heated drama to a peaceful resolve as their themes transform into each other and end gently. This sempre pp movement may be imagined as occurring underwater; an opening "glub-glub" motive evokes bubbles rising through water, and the wiggly sixteenths are like gentle fins waving. The dialog is more subtly integrated than in previous movements, and St. Francis's voice alludes to other musical fish. The inspiring majesty of the infinite sky is salted with twinkling stars; St. Francis's voice becomes one with the harmony of the Universe. "Finishing off the afternoon recitals was Barbara Haney performing a program of bass clarinet works. Ms. Haney plays with a full and resonant tone, showing her confidence and command of the instrument in all registers and dynamics. Her dynamic contrast, phrase direction and attention to detail showcases her musicianship and dedication to the music she performs. 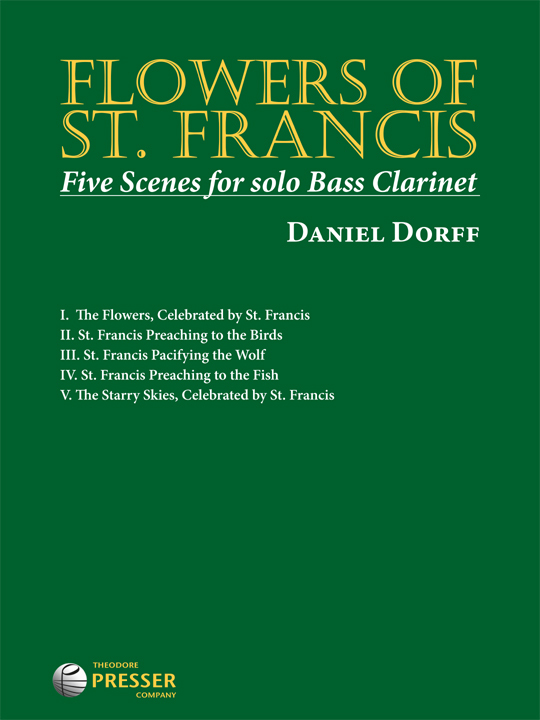 Daniel Dorff's work, Flowers of St. Francis, shows his love of the bass clarinet and his deft ability to paint scenery throughout the varied registers of the bass clarinet, each with its own distinctive timbre." - REVIEW by Gregory Barrett in The Clarinet magazine, September 2014. "Written for Barbara Haney to perform at ClarinetFest 2013 in Assisi, Italy, this five-movement suite uses descriptive titles and musical effects to celebrate flowers, bird calls, a wolf, fish, and starry skies all in relation to St. Francis, who is depicted by solemn pseudo-Gregorian chant. The is good college-level study or performance material with idiomatic use of the bass clarinet: overblowing bugle-like harmonics, clarinet-specific tremolos, large leaps and large dynamic range. The conservative tonal language and easy key signatures will allow a player to focus on imaginative playing without being overburdened by technical difficulties.